— Space shuttle Endeavour's final flight plan — and road trip map — were revealed on Wednesday (Aug. 8), previewing the cross-country, and cross-county, routes the retired NASA orbiter will follow before landing at the California Science Center for display. 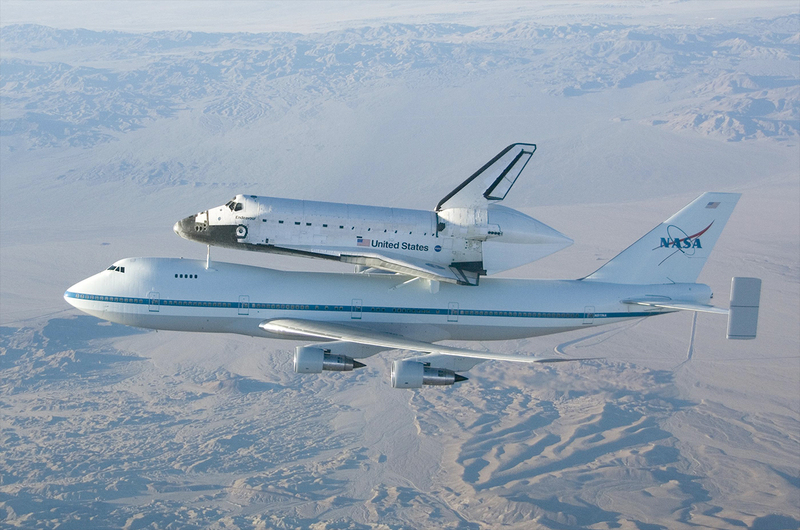 Endeavour, the youngest of NASA's shuttles having been built after the 1986 space shuttle Challenger tragedy, flew 25 space missions between 1992 and 2011. Next month, it will embark on "Mission 26," which will (tentatively) span 26 days to travel from Florida to the Los Angeles museum. "We are calling it 'The Big Endeavour,'" Jeffrey Rudolph, the president of the California Science Center (CSC), told collectSPACE. "It is pretty exciting and yet a challenging task. We've a lot of things to do to make sure everything works, but we're ready to go." 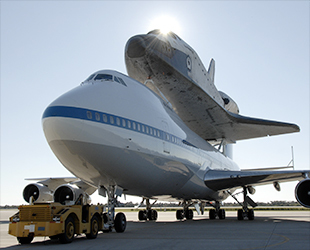 Departing its launch site at the Kennedy Space Center in Florida for a final time, Endeavour will be ferried on top of NASA's modified Boeing 747 Shuttle Carrier Aircraft (SCA) to Los Angeles International Airport (LAX), touching down mid-day on Sept. 20. The target date is flexible, pending weather conditions, but NASA has tentatively set Sept. 17 for the shuttle's farewell from Florida. 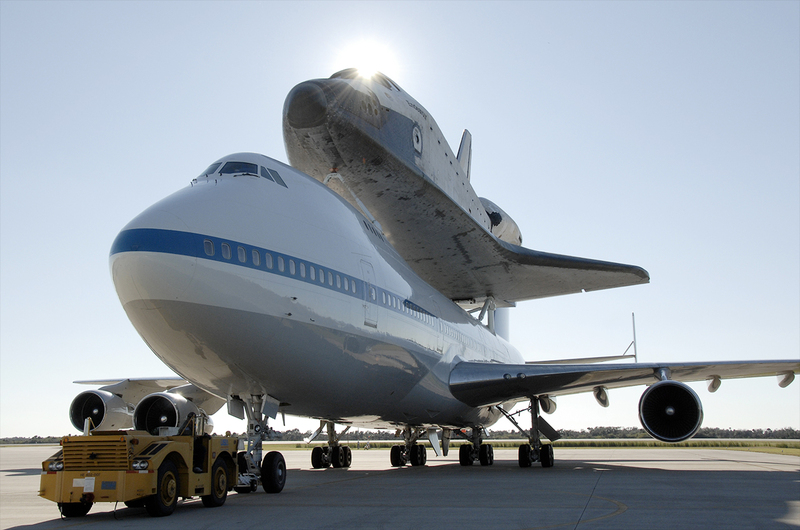 Endeavour will spend two weeks at the airport, housed in a hangar on loan from United Airlines. 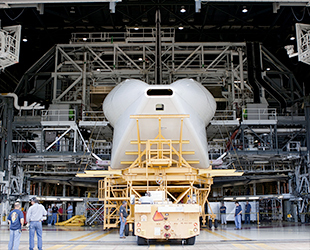 On Oct. 12, it will leave on a 2-day, 12-mile road trip atop a NASA wheeled transporter. Described by the mayor of Los Angeles as the "mother of all parades," the slow but steady procession through the streets of L.A. and Inglewood will feature a 'half time' show produced by famed actress Debbie Allen. "Los Angeles is a world class city that deserves an out of this world attraction like the Endeavour," said Los Angeles Mayor Antonio Villaraigosa in a statement. "We welcome the shuttle with open arms." "We look forward to everyone joining in the celebration," said Rudolph. 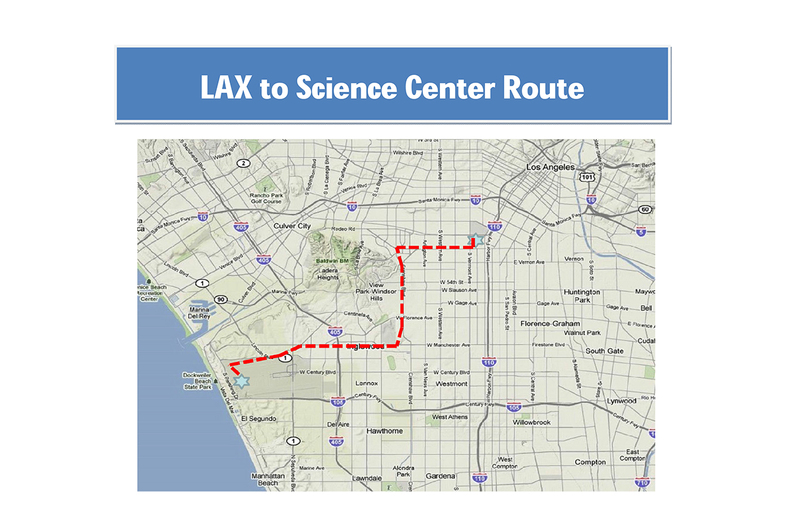 "This will mark the first, last and only time a shuttle will travel through 12 miles of urban, public streets. It is not only one of the biggest objects ever transported down city streets; it's an irreplaceable national treasure. Most importantly, this marks the beginning of Endeavour's ultimate mission of inspiring current and future innovators and explorers at the California Science Center." Rolling up in the early evening hours of Saturday, Oct. 13, the five story tall, 78 foot wide (24 meters), 170,000 pound (77,111 kilogram) winged spacecraft will enter the CSC's newly-erected Samuel Oschin Space Shuttle Endeavour Display Pavilion. The building, which was named after the late philanthropist whose foundation made a significant gift to exhibit Endeavour, will open to the public on Oct. 30. 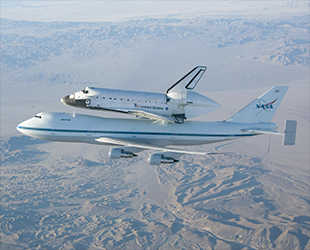 Endeavour's ferry flight atop NASA's SCA jumbo jet will proceed similarly to the earlier deliveries of space shuttle Discovery to the Smithsonian in Washington, D.C. and the prototype orbiter Enterprise that was flown to the Intrepid Sea, Air and Space Museum in New York City. In both earlier cases, the shuttle made spectacular flyovers of the cities' metropolitan areas and landmarks before touching down. "The final decision and determination on flyovers is very close to the actual date," said Rudolph. "Because of FAA and NASA requirements, they won't determine anything until later. But we are obviously in discussions with them about flyovers and the precedent that was set in New York and D.C. helps make it likely." Once on the ground at LAX, the shuttle-747 combo will taxi from the runway to a United Airlines hangar located on the west side of the airport. There, NASA will have already staged large cranes to hoist Endeavour off of the aircraft's back and onto the wheeled overland transporter. "It is a week to ten days of work to prepare the orbiter, getting it de-mated, taking off the tail cone, and doing the miscellaneous other work we need for transport," Rudolph told collectSPACE. "And then we'll hopefully have a little extra [time] there, as we have built in a cushion. So if any weather issues delay the ferry flight in Florida or anywhere across the country on the way, our contingency for that is extra time at LAX." "We don't have flexibility with respect to the days that we move from the airport to the science center. That has to go on the day it's planned," he added. The move from LAX to the CSC will begin in the late night hours of Friday, Oct. 12 to avoid impacting active aircraft operations and to facilitate navigating around power lines. "There are some transmission lines that have to be shut down to be moved out of the way and can't be done during regular daylight hours," Rudolph said. "They have to do it overnight because of the grid demands. So, overnight will be a series of moves through, I think it's four transmission lines that are particularly challenging." 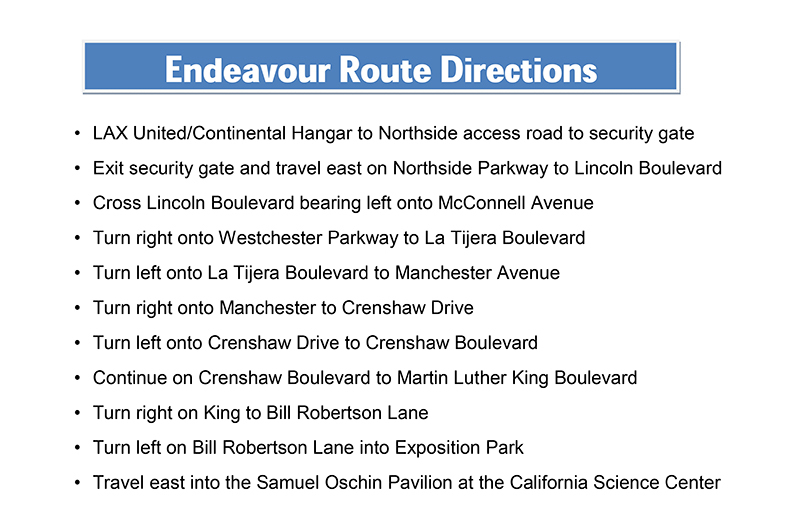 Beyond those lines, the late night to early morning move will take space shuttle Endeavour across the 405 Freeway to arrive at Inglewood City Hall for a launch ceremony on the morning of Saturday, Oct. 13. "The procession of the Endeavour to its new home at the California Science Center will allow our children to bear witness to history, up close and personally," said James T. Butts, the mayor of Inglewood, in a statement. "We are proud that the City of Inglewood will be involved in this great event." 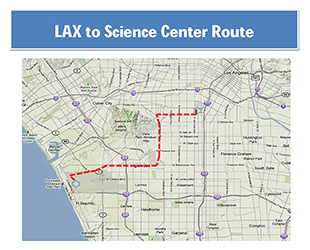 Moving the shuttle from the city hall to the CSC, which is located south of downtown LA in historic Exposition Park, will take the entire day. "We are going to start in the morning at about 8, 8:30 by Inglewood City Hall and plan about dusk to arrive at the science center," Rudolph said. "It will be a full day." Though the trek is only 12 miles, the city streets were not designed to accommodate a space shuttle. The move will be made slow and steady, with certain phases slower and steadier than others. "There are two or three areas [along the route] that are a little of a challenge," Rudolph explained. "Basically, what it comes down to [is], there are areas where we have more street lights and trees where we're trying not to move them but move around them and then there are areas with wider streets without as many obstructions." Of most concern are a couple of points along the way with older, larger trees. They could be cut back or removed, but the science center is working hard to save them. "That is requiring some really careful maneuvering. It is a matter of inches, not feet, from the side of the shuttle. We will be spotting it and going really slowly to make sure we get through," said Rudolph. The pace of the parade will give people ample opportunity to see Endeavour as it rolls by. But if the sight of a shuttle isn't enough, the spectators will also be treated to a public performance inspired by the themes of flight and space. At the intersection of Martin Luther King and Crenshaw Boulevards, a celebration of "Mission 26" will be produced by renowned actress and choreographer Debbie Allen. "We have got Debbie Allen, a producer, working with us to produce a 20 to 30 minute show that will be really beautiful and that will include some marching bands and elements of dance, aerial performances and the like," Rudolph said. 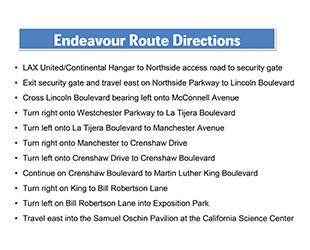 The procession will end when Endeavour pulls up to the science center's Samuel Oschin Display Pavilion. 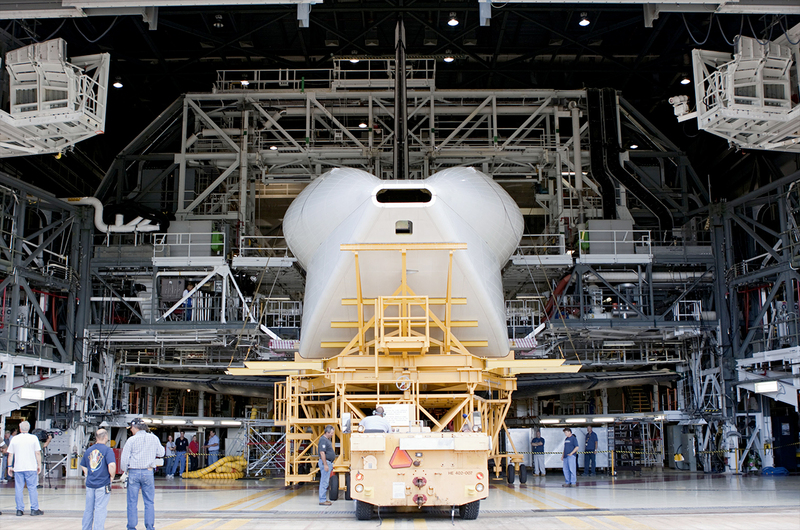 But the public won't have to wait long to get another close-up look at the shuttle. "We are looking at opening day on the 30th of October," Rudolph said. "We are really working hard to have it open as soon as possible because we know there is going to be a lot of demand." When the doors open to visitors, the Oschin Pavilion will display Endeavour atop of the overland transporter used to deliver the shuttle to the science center. Surrounding the orbiter will be artifacts and exhibits chosen to help share the shuttle's story. "We will have a preview exhibit focusing on the California story — a little on the history of Endeavour, how it came to be, its naming, and it being built here [in California]," Rudolph shared. "Rocketdyne is giving us the ROSC, the control center and launch control they have that monitored the main engines during the launch of the space shuttles." The pavilion will also house a number of components that were previously inside Endeavour's crew compartment. As visitors won't be able to enter the space shuttle, some of its fixtures, including the food galley and waste collection system (toilet), will be displayed alongside the orbiter. "We expect to have a main engine in the pavilion and the Spacehab [logistics module]," added Rudolph. "So we've got a number of wonderful things to go with the shuttle and they'll add to its story as well." The exhibit, and in fact, the whole pavilion, is intended as only a temporary display, though. The CSC has begun design of the Samuel Oschin Air and Space Center, Endeavour's permanent home, tentatively scheduled to open in 2017. With the space shuttle raised vertically and mounted to twin solid rocket boosters and a replica external fuel tank, the new facility will — as the center describes it — be a "launch pad for creativity and innovation by integrating hands-on exhibits with a unique collection of aircraft and spacecraft to encourage active learning and critical thinking."